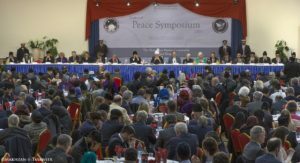 The aim of the Peace Symposium is to promote a deeper understanding of Islam and its teachings for establishing peace. 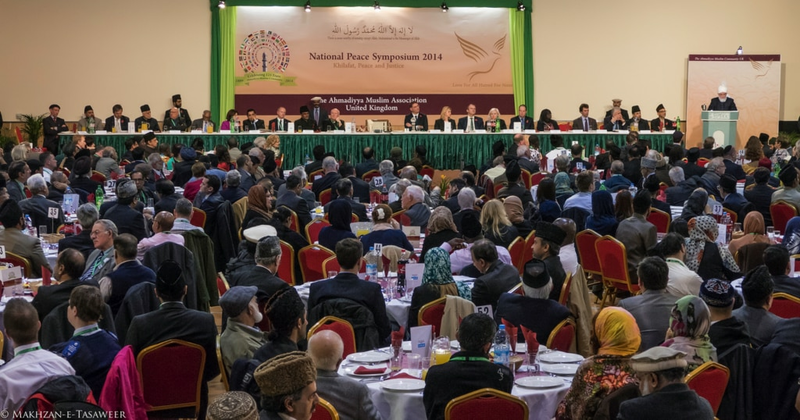 The theme for this year’s 16th Peace Symposium is ‘The critical need for Peace’. 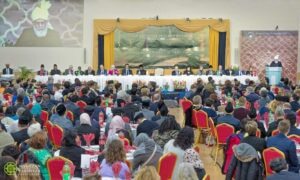 More than 800 delegates attend the unique event including Secretaries of State, Parliamentarians, Diplomats, faith and civic leaders as well as representatives from numerous charities and faith communities. Guests will be given a guided tour of the mosque. 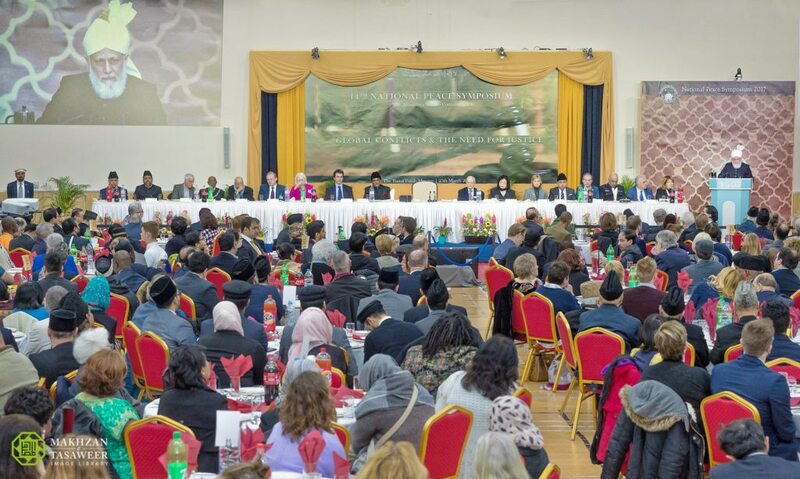 Dignitaries will give short speeches before the keynote address by the Caliph, His Holiness Hazrat Mirza Masroor Ahmad. Interviews on the day can be arranged. High resolution pictures of previous events are available on request. 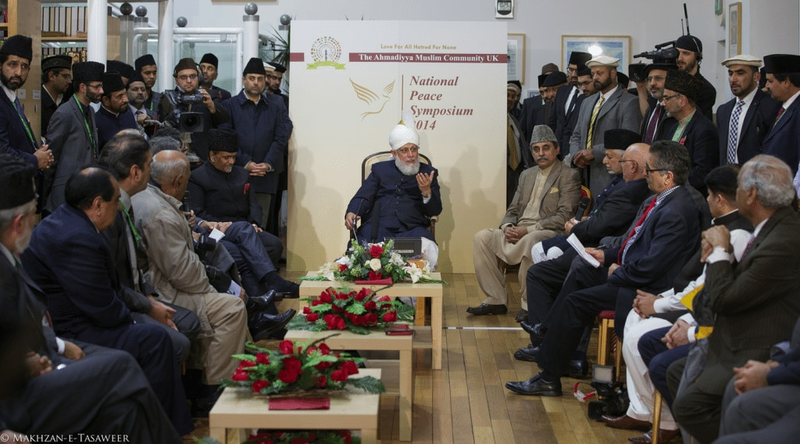 Please send your name, phone number, email, and the name of the organisation to: media@pressahmadiyya.com. 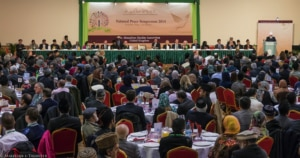 Broadcasters are invited for filming of the proceedings and interviews with delegates and speakers. 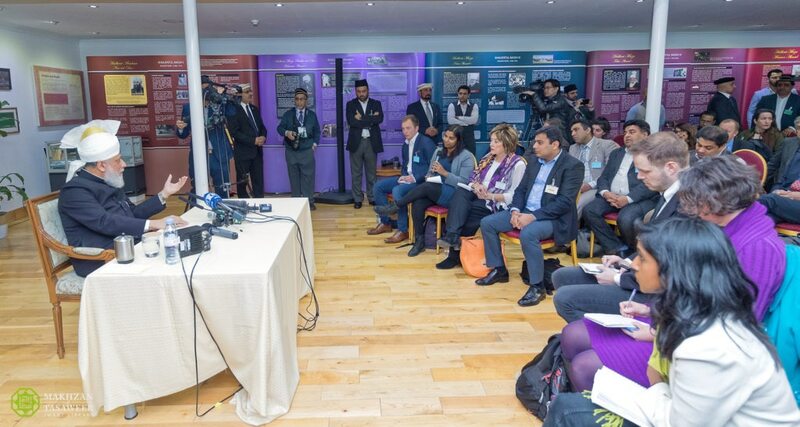 The venue is equipped with a media centre for journalists to make use of. Parking is available on site for cars and media trucks. 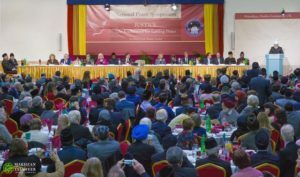 The prize was launched at the 2009 UK Jalsa Salana (Annual Convention), by His Holiness Hazrat Mirza Masroor Ahmad, the Head of the worldwide Ahmadiyya Muslim Community. 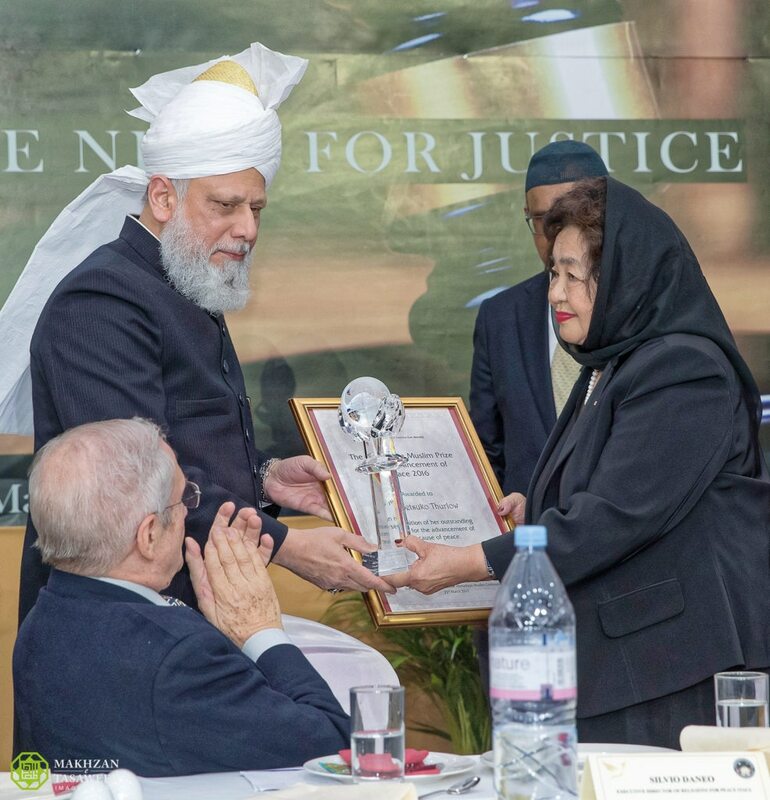 It is awarded in recognition of an individual’s or an organisation’s contribution for the advancement of the cause of peace. The award comprises a certificate and £10,000. The 2018 Ahmadiyya Muslim Prize for the Advancement of Peace that will be presented at the 2019 Peace Symposium. 2018 winner: Dr Fred Mednick – Teachers without borders (TWB) was launched in 2000, with a mission to connect teachers to information and each other in order to close the education divide and based upon the premise that teachers are community change agents and key catalysts of global development priorities.The organization was founded by Dr. Fred Mednick. 2017: Dr Leonid Roshal – Dr Leonid Roshal is a distinguished paediatrician from Moscow, an expert for the World Health Organisation and the Chairman of an International charity fund to help children in disaster and wars. 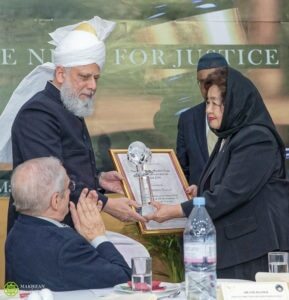 2016: Mrs Setsuko Thurlow – Mrs Setsuko Thurlow is a Hiroshima survivor and an inspiration for many in the international campaign for nuclear disarmament. 2015: Hadeel Qasim (Iraq) – Hadeel has made a tremendous difference to the lives of refugees, especially children who have been displaced as a result of conflicts. 2014: Sindhutai Sapkal – Awarded for her inspirational work to look after orphans in India. 2013: Magnus-MacFarlane-Barrow – Awarded for his outstanding work to promote education and to relieve poverty. 2012: Dr. Oheneba Boachie-Adjei – Awarded for his life-changing medical work to help children across the world, especially in Africa. 2011: SOS children’s villages UK– Awarded for its humanitarian work with children across the world. 2010: Abdul Sattar Edhi – Awarded for his life saving and development work in Pakistan and other countries. 2009: Lord Eric Avebury – Awarded for his long-standing service to the cause of peace, with particular focus on human rights.